The guy who was Wolverine for decades of Marvel Comics’ publishing history is dead. The new Wolverine—a female clone of Logan also known as X-23—is a stone-cold killer just like him. But she needs to figure out how to be something more. 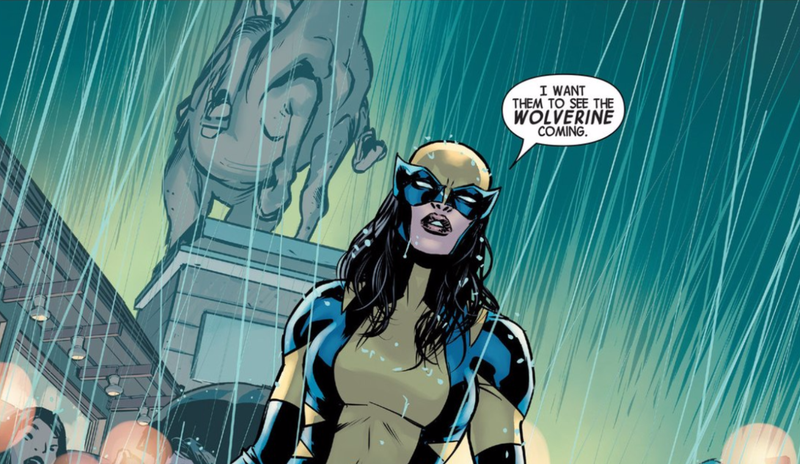 A woman named Laura Kinney puts on a yellow-and-blue Wolverine costume for the first time in All-New Wolverine #1, by Tom Taylor, David Lopez, David Navarrot and Nathan Fairbairn. Kinney has been around for years as the character X-23, starred in her own book and worked with Logan on a secret X-Men kill squad called X-Force. One of the best sequences in this issue flashes back to a near-death moment that Laura and Logan shared after she’d been blown up by a bazooka projectile. Laura has long tried to be more than just a killing machine. It’s a struggle that Logan faced and mostly won by the latter half of his life. He had centuries to reclaim his humanity. Laura’s been alive for only a fraction of his lifespan. Normal human interactions like making friends have been a challenge for her, especially when she’s continued to live a life where she’s had to end the existence of others. She has managed to get close to some of her X-Men teammates over the years, including the younger version of the X-Man Angel pulled forward through the timestream. Laura is business first, though, and her business can be ugly, especially to a teammate who’s the product of a simpler era. You can see the pair’s growing pains in a snippet from this first issue. Explosions and broken bones aside, it’s a beat that would be at home in a romantic comedy. The gritty action moments will be a given in All-New Wolverine but I hope they’re balanced by lighter moments like these. Like her predecessor, the new Wolverine was used by other people as a lethal tool. That moment with Angel illustrates that she didn’t get much affection in her old life and doesn’t quite know how to process it. Nevertheless, somewhere deep inside, she knows that she needs it. She is going to have to balance that desire with tracking down and eliminating some of the deadliest assassins on earth. So far, it seems like All-New Wolverine is set to explore a killer X-Man that is a lot more vulnerable than the man who came before her.